What's the Best Wood Carving Tool? and Which Method is our Favorite? Finding the right tools for your next project can be a big challenge, even when you know what type of tool you’ll need. It can be hard to navigate the online buying process, and many people end up with a product that makes them feel like they got a bad deal, or end up spending money on an item that doesn’t work. In this guide, we walk you through the situations in which you should use each type of tool, to help you find the type that’s right for your situation and your next project. Then, we recommend a single product that should cover all of your needs, at a great price. We’ve also included a buyer’s guide where we cover these topics in greater depth so you can make sure you’re getting the right tool before you buy, and end up getting a tool with which you’re very satisfied. If you’re looking to get into wood carving, you may be tempted to look at a set of power tools for getting the job done. However, our preferred method is to carve our pieces by hand. While it is slower, you have more control over the process. It’s harder to make a critical mistake when using hand-carving tools since they don’t ever feel like they’re going to get away from you. Plus, you get to learn how to sharpen your own tools, which takes some time to learn, but lets you customize your tools to your preferences. For carving wood by hand, we recommend the SCHAAF Full Size Wood Carving Tools, Set of 12. This set comes with 12 chisels, which give you a wide range of possible carving actions. They’re forged from chrome vanadium steel, so they’re extremely strong and hold their edges well. They have octagonal handles, so they won’t roll. Also included is a storage sleeve, which gives you a way to protect your chisels when they’re not in use. Overall this is the best wood carving set out there, though it does require sharpening, which is something to keep in mind before you buy. If you’re a wood carving professional looking to take your skills to the next level, you’ll need to invest in a high-quality power carving tool. These tools work much faster, and they take some time to get used to, but they ultimately produce cleaner lines than those you’re able to get with a hand carving set. While they tend to be a big investment, you can get years of use out of them, and they’ll greatly speed up your projects. For those interested in getting a power carving tool, we recommend the King Arthur’s Tools 10005 Merlin 2 Mini Grinder Carving Kit. This powerful rotary tool comes with a great cutting blade, and a variety of sanding discs you can swap out to finish your projects. The tool is variable speed, so you can run it at the speed you need to for the task at hand. It also has more air vents than the previous model, which keeps it cooler for longer under pressure. While some units burn out prematurely, this is still the best power carving tool on the market. If you’re a true beginner in the wood carving world, and just want to learn the ropes, it doesn’t make any sense to invest in a professional-grade set of chisels or a power tool. If you end up not loving the experience, the investment will never pay for itself. You need an inexpensive set of chisels that can let you learn the ropes without spending too much. Unfortunately, many cheap sets are also low-quality, so it’s not a good idea to buy one without doing your due diligence. If you’re looking for a set that comes at a low price, but has decent quality, we recommend the VonHaus 16pc Wood Carving Knife Tool Set. It comes with a good variety of chisels, as well as a mallet, so you can get started without investing in any other pieces. It’s also about a third as expensive as our top chisel set, making it a great budget buy. The downside keeping these tools from a higher place on our list is their slick handles, which make them hard to hold. Still, that’s a downside that most people will be fine with, given this set’s great price. Carving knives tend to give a smoother edge and finish than chisels, though they do tend to remove material more slowly. Consequently, many woodworkers make use of both, using chisels for the rough cut, and then switching to knives to finish the project off. If you’re looking to make projects that have a perfectly smooth exterior, instead of the rough, blocky look chisels give you, you’ll want to invest in a high-quality carving knife set. Knives are more intuitive than chisels, so they’re a decent buy for beginners, though most people more strongly associate chisels with woodworking. If you’re looking for a good-value set of woodworking knives, we recommend the Flexcut Tool KN500 Flexcut, 3-Piece Knife Starter Set. This set comes well-sharpened, which is good since knives can be hard to sharpen. 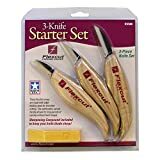 This set also comes with three of the most common carving blades, the cutting, detail, and roughing knives, which allow you to take a project all the way from start to finish. They’re on the large side for people with small hands, which is our only concern. Overall, you get three knives for the cost of two, making this set good bang for the buck. If you’re looking to get into wood carving, but aren’t feeling particularly inventive yet, it’s a good idea to go with projects that are simple and straightforward. These allow you to gain familiarity with the tools of the trade without having to worry about the project as a whole. Spoon carving is a great opportunity here. We all already know what spoons are supposed to look like, and many companies already sell “spoon blanks” or blocks of wood that are ready to be carved into a high-quality spoon. That makes them an inexpensive entry point into this field. For those looking for a spoon carving set, we recommend the Beavercraft Wood Carving S13 Tools Set. This set comes with three knives, including a hook knife which makes carving round surfaces, like the spoon’s face, easy. These knives are also easy to sharpen, and this set comes with a sharpening block. However, this kit does have some minor quality control issues like small nicks in the blade, and the knives don’t always come sharpened. Of course, that gives you an opportunity to learn how to care for your tools right off the bat. Chisels are what most people think of when they think about wood carving. This category can be further broken down into two subcategories, which are used in different scenarios. The first of these is palm tools. These are chisels that don’t require the use of a mallet. The force of your hands alone will be enough to push them through the wood. They generally have shorter shafts to give you more control, and have some of the smallest faces, making them good for detail work. The second type is mallet tools. When you have a lot of waste wood to remove, the mallet tool is the one you’ll want to grab. The wider blade profile on a mallet chisel allows you to remove more wood at once, and the use of a mallet gives each stroke greater removal potential. Beyond the type of cuts that you’re making, you also have to consider the hardness of the wood when you’re making the selection between these two. If you’re working with very hard wood, you may be forced to make use of a chisel. You could push harder with your hands alone, but that increases the chances of the chisel slipping and causing a problem. The single, large stroke from the mallet tool provides less opportunity for slipping, making it generally the superior choice in these situations. With softer woods, mallet chisels will likely be overkill. In fact, the extra power could result in you removing more material than you want to remove, which can be a problem in its own right. Instead, it’s a good idea to use palm chisels. Carving knives, not to be confused with the culinary tool of the same name, are the tools you’ll want to go to if you’re looking for an extremely fine finish. While you can achieve a decent level of smoothness with a fine chisel, many people use the chisel because they’re looking for a blockier, rough-cut look. If you instead want something that will look and feel smooth, and on which you’ll want to put a shiny varnish, you’ll probably want to use carving knives for some or all of the project. Knives generally aren’t going to be as good at removing waste wood as mallet chisels, but they excel in doing tight detail work. If you’re trying to carve tiny channels, or just smooth out the surface of an object, you’d be hard-pressed to find a better tool than the carving knife. Carving knives have also carved out a niche for themselves when it comes to creating rounded objects. The hook knife is a curved knife used to create the interiors of spoons and bowls, which is difficult to do with a chisel or a straight knife. The big upside to power carving tools is that they have the potential to remove a lot of material in record time. The big downside to power carving tools is that they can remove a lot of material in a short amount of time and may remove more than you want if you’re not careful. You need steady hands and a plan before you start using power carving tools, as they can be very unforgiving. However, they excel in some areas in which both carving knives and chisels struggle. For instance, they’re not nearly as limited by the grain of the material as those manual tools. While it may seem like the power tool is removing a lot of material at once, if we were to slow time down, we would see that it makes hundreds or thousands of tiny cuts every minute, so its cuts are generally smaller than the grain. It won’t splinter the wood like the comparatively thick manual tools might. These tools often come with sanding attachments, which makes it easy to give your projects a nice finish without having to change tools. Which wood carving tool is right for you? The biggest determiner of which tool you should get is the kind of project you’ll be doing. Some projects call for different kinds of tools. If you’re looking for a rough finish, chisels should be the way you go. If you’re looking for something smoother, carving knives are a good choice. If you’re looking for power, and don’t want to worry as much about how the grain will affect your cut, you can use a power carving tool to make the job quicker and easier. Of course, it’s important that you invest in a model you enjoy using. That means you have to consider what features you need for a good experience before you look at the price tag. It’s not worth getting a tool, no matter how low the price, if you don’t end up liking it. 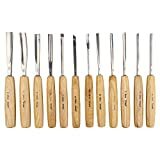 The SCHAAF Full Size Wood Carving Tools, Set of 12 is the best wood carving set for those looking for a good beginner to mid-range set, due to its wide range of chisels, the octagonal handles, and included storage sleeve. 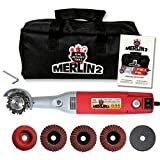 If you’re looking for a great power carving tool, you can’t go wrong with the King Arthur’s Tools 10005 Merlin 2 Mini Grinder Carving Kit, which runs cool and includes sanding accessories. 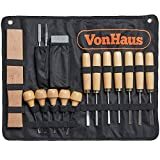 For beginners, we recommend the VonHaus 16pc Wood Carving Knife Tool Set, which provides good quality at a low price, and includes a mallet. The Flexcut Tool KN500 Flexcut, 3-Piece Knife Starter Set is another kit that we think provides good bang for the buck, and since this set includes three great blades at a great price, we’re sure you’ll think so, too. If you’re looking to carve spoons, we recommend the Beavercraft Wood Carving S13 Tools Set, which comes with three knives that are easy to sharpen. We hope that our reviews of wood carving equipment and buyer’s guide have helped you understand when you should use certain tools, and helped you find the equipment that’s right for your next project.